Children have a natural connection to all things metaphysical, including the healing power of crystals. They tend to be extremely open and they don’t question what they’re feeling. They just know when certain crystals feel “right” to them. One of my favorite things to do is offer a bowl of the twenty-five tumbled stones (easy to find and cost effective) contained in my book “Healing with Crystals for Kids!” to a child to see which ones they are intuitively drawn to. Then, you can read through the descriptions with them to see if there is an energetic reason that they were drawn to a certain crystal at a certain time. Sometimes you’ll find that they’ve been having trouble expressing themselves and they’ll intuitively choose a throat chakra crystal. Sometimes, the reason is as simple as “it’s purple”, which is a perfectly good reason at any age! My book also contains information about the body’s seven main chakras or energy centers. These are explained in a kid-friendly way that can really help them utilize their own personal power. This can be a tremendous help when emotions are unbalanced or communication isn’t going smoothly. When children have been taught how to take a few minutes to ground and center themselves, the results can be miraculous. I also included basic scientific information, historical information, and crystal care instructions. The most common question we receive at Healingcrystals.com is “how do I cleanse my crystals?”. It’s never to early to start learning! I enlisted the help of my own son when I chose the list of crystals to include in the book. I wanted it to be a great mix of basics with a few extra-interesting ones thrown in for good measure. In the book, kids can read about Amethyst, Angelite, Aquamarine, Black Tourmaline, Blue Calcite, Blue Lace Agate, Carnelian, Cavensite, Citrine, Clear Quartz, Fluorite, Green Aventurine, Hematite, Howlite, Jade, Labradorite, Moonstone, Rainbow Aura Quartz, Red Jasper, Rose Quartz, Selenite, Smoky Quartz, Snowflake Obsidian, Sodalite, and Tiger Eye. Kids are capable of learning a great deal so easily...their brains are like little sponges! It’s so beneficial when we can present them with information that will help them develop a healthy body, mind, and spirit. And hey…even if they just like crystals because they’re sparkly, that’s okay too! 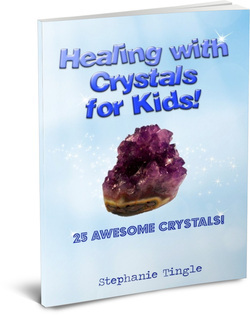 “Healing with Crystals for Kids!” is available as a paperback on Amazon or for Kindle devices and Kindle apps. The paperback version contains additional pages for journaling about each crystal. It’s available for FREE through Kindle Unlimited! https://goo.gl/9ssGXb. Please feel free to contact me through www.stephanietingle.com information about discounts on larger quantities of the paperback version for retail or classroom applications.